Summary: The 700 wagons that make up the FSA/FTA fleet represented proabably the largest investment in railway-owned wagons during the 1990s, and were also the first such vehicles to be imported rather than home-built. Fairly standard container-carrying wagons, they bolstered the ageing Freightliner fleet, allowing for retirement of many FFAs and FGAs. History: By the mid 1980s Freightliner was in need of new wagons. Traffic was growing but the existing fleet of FFA/FGA container flats, built between 1964 and 1976, were showing signs of fatigue, caused by intensive diagramming and unbalanced loading of 40ft containers. It had been expected that any new wagons would be 40ft long to combat this problem, and a 2-axle prototype to this length was built by BREL at Shildon in 1981. At that time, Freightliner was operating as a stand-alone company and the skeletal wagon was numbered in the private-owner series as PFA F93000 (design code PF006A). However, the recognition of the poorer riding and track impact qualities of fixed chassis wagons over bogie types saw this plan shelved and the wagon was stored then condemned. 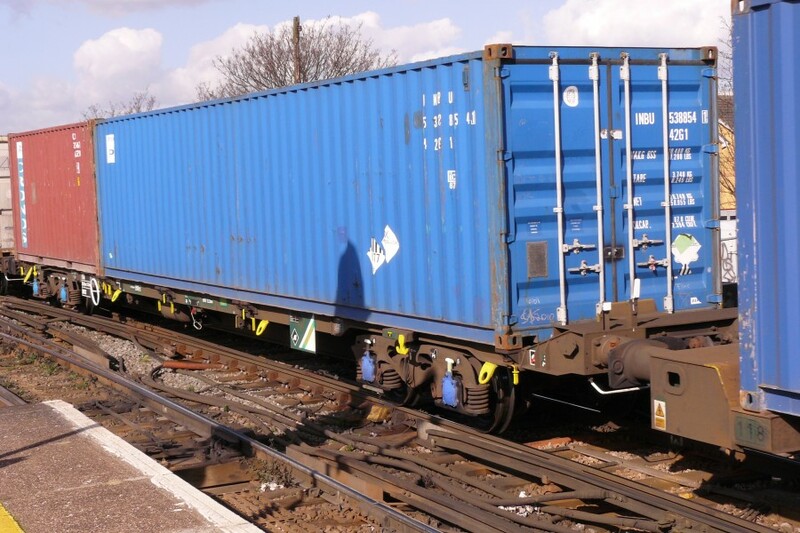 To allow for expansion, Freightliner hired a number of bogie container flats from wagon leasing companies. First to arrive were 20 from Railease in 1986. Numbered RLS92632 to RLS92651 these were PFAs to design code PF010A. Within a couple of years these were returned to Railease and most were later modified as PNA pallet wagons for use by Redland. A much larger batch of 100 wagons was hired from Tiphook from the winter of 1988/1989. Drawn from the TIPH93290-93489 batch, these were PFAs to design code PF010C, changed in 1990 to KFA/KF010D. Despite the later arrival of several batches of owned wagons, many of the Tiphook flats remain in Freightliner service to this day. The AARKNDs were related to the wagon type (I for inner, O for outer) even though the CARKND already provided this information. There would, for example, never be an FSA-I. The design codes followed from FS001x and FT001x, both of which had already been used for Conflat conversions. The FSA/FTA fleet was the first sizable batch of 'railway-owned' wagons not to have been built in Britain. The first wagons arrived via the Dover train ferry in April 1991 and FSAs 608001 and 608002 were dispatched to Derby for acceptance tests. They later returned to France for modifications to the handbrakes. Other FSAs were delivered to Southampton and Eastleigh through the summer and most made a trip up to the Bombadier Prorail works at Horbury for modifications, presumably related to those on the pioneering pair. Entry to service took place in late October 1991. Deliveries of FSAs continued throughout 1992 and by the time the first FTA inner wagon arrived in June, there were over 250 in stock. The original contract had called for the entire fleet to be delivered by July 1994 but this was achieved much earlier, a small ceremony being held in Southampton on 7th December 1993 to mark the final deliveries. The wagons were used on Freightliner services across the country, often mixed with FFA/FGA sets. As delivered, the FSA/FTA fleet wore a black livery relieved by the yellow and red diamonds logo of Speedlink Distribution. These logos, and the TOPS number panels, were carried on boards mounted on the solebar. Notably the wagons all had ferry fittings (ie tie-down lugs) though none were ever registered to work to the continent. Another interesting aspect of the design was the configuration of the couplings. Unlike the FFA/FGA fleet, which used bar couplings within sets, the FSA/FTA inner connections were of a conventional design, including buffers, pipes and screw-link couplings. However, these were mounted slightly lower down than normal. This no doubt had operational benefits, making it easier to split and re-form sets, but it is curious. Given the expense of providing buffers, pipes and couplings at each end, surely it would have made more sense to mount them all at the same height, thus allowing greater flexibility. All wagons were fitted with traditional-style builders plates, albeit cast in aluminium and unpainted. This was probably the only time that such plates featured a foreign place name (the builder being shown as AFR. DOUAI). Most of the plates appear to still be fitted, but are now painted green with the lettering picked out in white. FSA 608044 was cut up after a derailment near Rugby in August 1995. With the sale of Freightliner in 199x, the FSA/FTA wagons started to appear in a green livery, and the diamonds logo was changed to the new corner triangle motif. This apart, the fleet has seen little change, other than a change to the formations. Three-wagons sets gave way to four-wagon sets, with a corresponding rise in the number of twins. 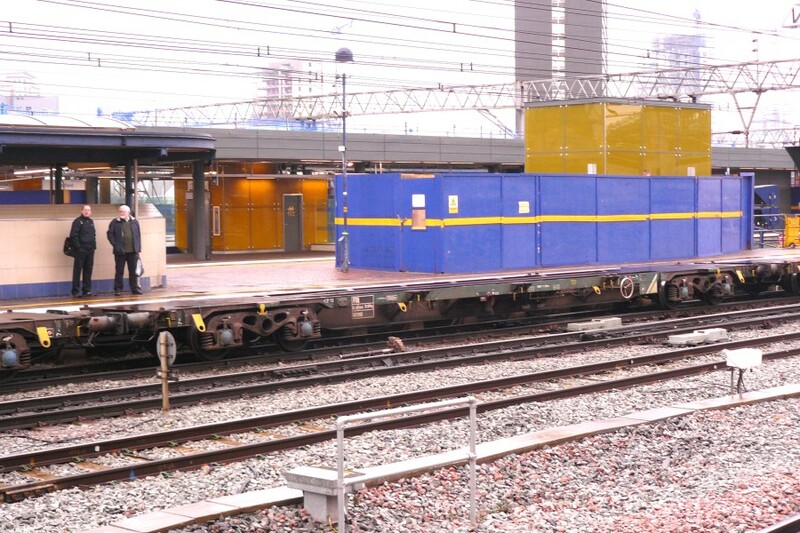 Having said that, a few three-wagon sets were reported to be in use in late 2007. By 2008, a total of 6 FSAs had been withdrawn, probably as a result of accident damage, although two of these were still showing on TOPS. The remaining wagons, including the intact FTAs, were still at work, mixed in with KFAs, FLAs and the newer FEA and KTA types. 16/03/2010: Photo of FTA added. FSA 608133 at Lewisham, 26th Feb 2008. The inner couplings are standard but mounted lower down. FTAs (such as 607008 here) have these at each end. Stratford, 18th February 2010.